The POWERplus Wolf is a high quality dynamo 3 LED flashlight with integrated FM scan radio. This compact model is a ‘must-have’ on every camping, outdoor activity but also for disaster purposes. 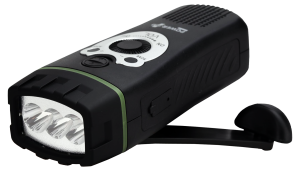 All though the Wolf is very compact and leight weight, the performance of both the 3 LED flashlight and FM radio are excellent. The Wolf can be charged by the integrated dynamo, but also by USB (USB charging cable included).